It is believed that in the middle ages (possibly from the 12th or 13th centuries) there were several frescoes of saints painted onto the inside, plastered church walls. Underneath the arch was painted an abstract design and this is still in a reasonable condition. Unfortunately no written record was kept of these paintings. 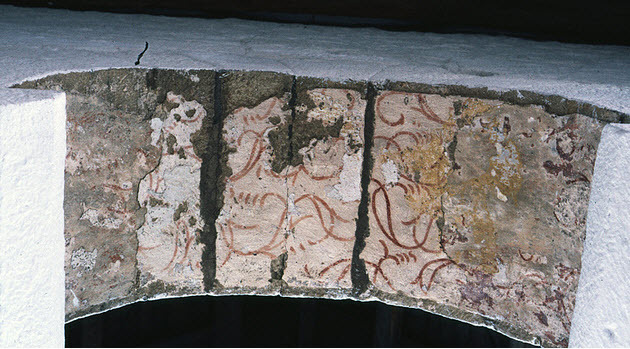 It is not possible to say what or who is depicted in the remains of a painting above the North door. There have been different theories since 1880. “It may be assumed that the painting in Escomb above the North door was in fairly good condition in 1880 when the old church was re-opened, as the portion of plaster containing the painting was spared and cleaned. The destruction of much of the wall plastering and painting was the result of the seventeen years neglect, during which time much of the southern part of the roof had collapsed, including a crude false ceiling at the level of the main beams…..
Just wondering do you know why they were covered up, just curious because in our local church you can see some left overs of some similar paintings?